While on our test run, Lorraine and Norm overtook us on the main street! 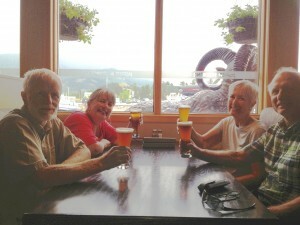 We spent a very enjoyable day with them, wandering around Jasper, stopping for lunch, then afternoon beers at the Jasper Brewing Companty and an excellent meal at Syrahs restaurant. 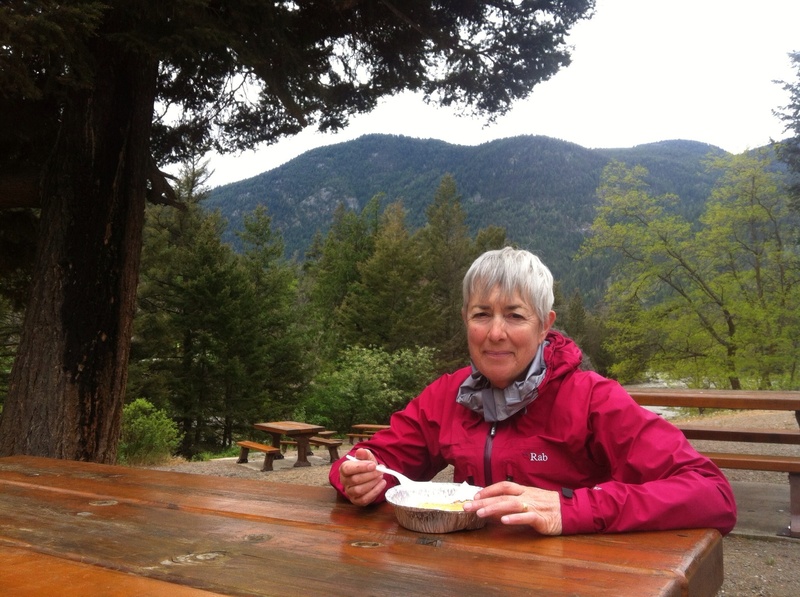 After dinner, we drove through the back streets of Jasper and up to Patricia Lake, spotting some mule deer on the way there, and elk on our return. 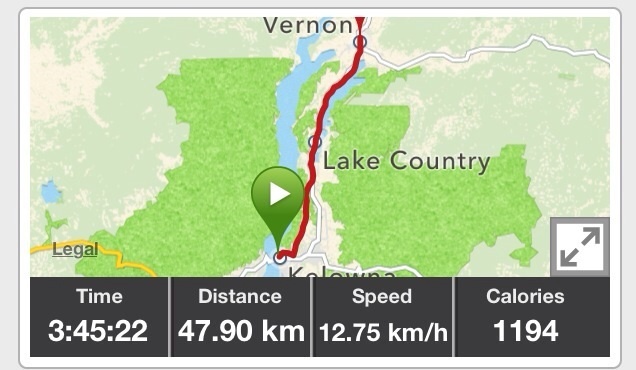 A Google search for breakfast spots identified a wonderful Swiss Bakery the other side of the railway tracks, by the Valemount Via Rail Station. Run by a Swiss woman and her professional baker husband, it offers full European (Swiss) breakfasts, sandwiches and a tantalizing selection of pastries, cakes and cookies, as well as good espresso. Breakfast began with a huge stack of thickly-sliced fresh bread, butter, homemade raspberry jam and a plate of Swiss cheese. This was followed with another plate of freshly-baked whole wheat bread to accompany eggs scrambled with tomatoes, onions, peppers and mushrooms. Almost too full to move, we pedalled off with a packed lunch of thick Swiss cheese and veggie sandwiches and a couple of pastries, including a mini Stollen! 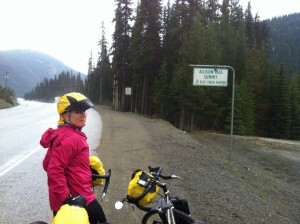 After 20 kilometres, we joined the Yellowhead (Highway 16) (the wide shoulders do continue!) 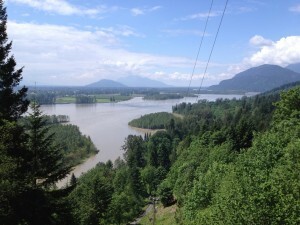 as well as the Fraser. 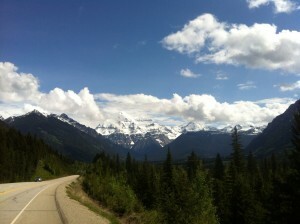 We stopped at the memorial, which points to Mount Terry Fox, where we also had a splendid view of Mt. Robson. Just after entering Mount Robson Park, we began a steep climb for a few kilometres. At the summit, a road maintenance crew had stopped traffic in both directions to repair the shoulder, which was slipping down the mountain. We were allowed to cycle past both lines of traffic, which on the opposing side was a kilometre long. It was quite blissful cycling down the open highway, free of traffic for a short time. 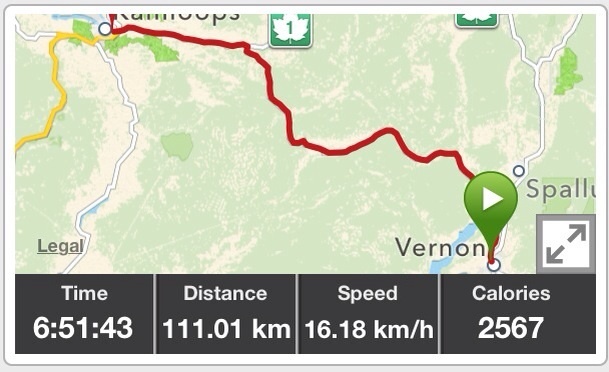 We finished up the stollen beside Moose Lake. 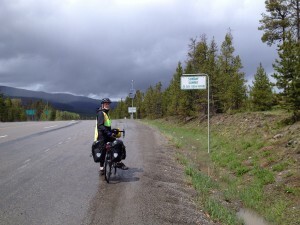 The sun was out and the cycling was good until we entered Alberta and Jasper National Park, where we soon got caught in a torrential thunderstorm, with the winds against us. 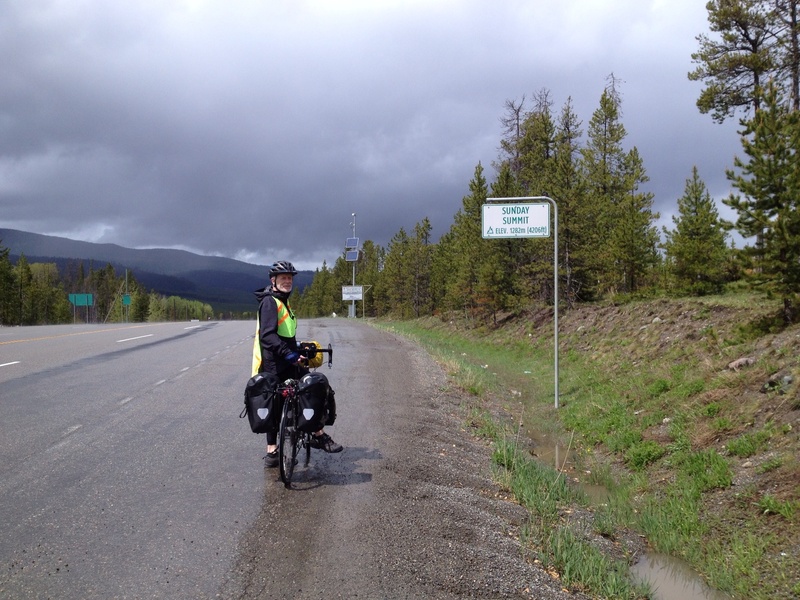 We finally arrived in Jasper at 9:00 pm local time, weary, wet and cold. But tomorrow is a day off. 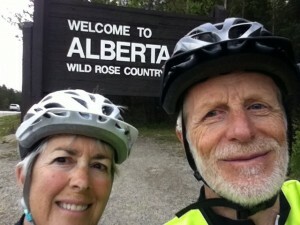 Lois’ sister and brother-in-law are driving from Prince George to meet up with us – bonus! We have now crossed one province , 9 more to go (sorry Territories – Nunavut you know we love you!). Wildlife sightings surprisingly sparse, only 3 elk. We are now on the traditional territory of the Aseniwuche Winewak Nation. 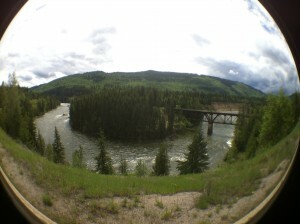 In 1907, Aboriginal Peoples in the Jasper area were evicted to create the national park. We passed the first 1000km mark on our cross-Canada tour today, just before Valemount! 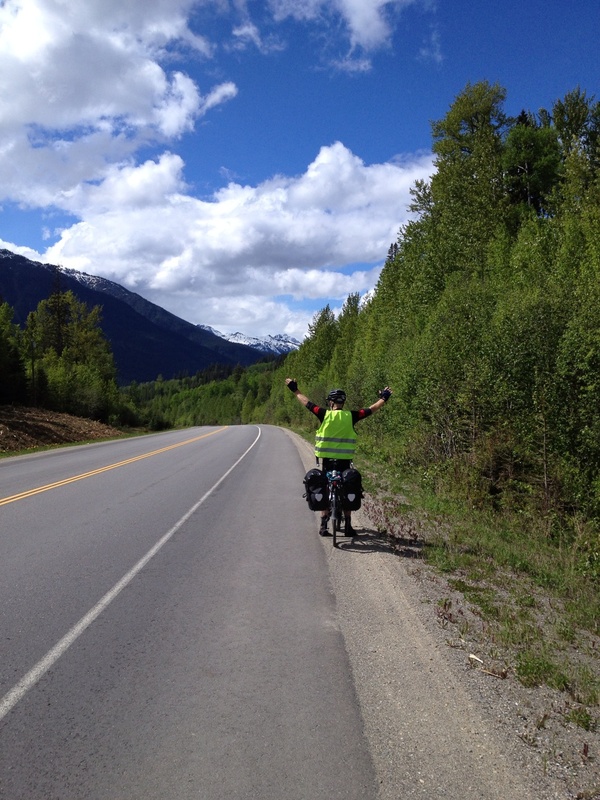 The ride was good – we’re hoping that the nice wide shoulders of the Southern Yellowhead (#5) continue on the Yellowhead, which we join tomorrow at Tete Jaune Cache and will be on throughout Saskatchewan and into Manitoba. 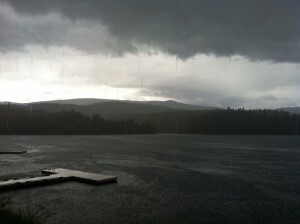 Showers threatened all day and the temperature rose – we finally discarded our rain gear, deciding it was preferable to be rained on to sweating under so many layers. The sun actually came out towards the end and the showers didn’t really happen. South of Valemount we left the North Thompson river, which has its source in the Thompson Glacier, west of Valemount. 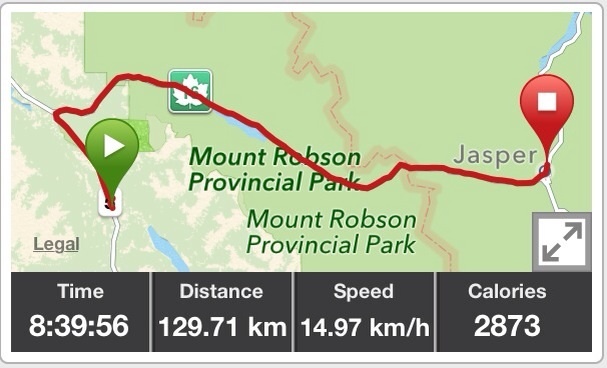 Apart from a very stiff hill coming into Valemount, it was a pleasant day. What’s with this weather? A temperature of 7 degrees again this morning. Everyone keeps talking about the heat wave we missed a couple of weeks ago. 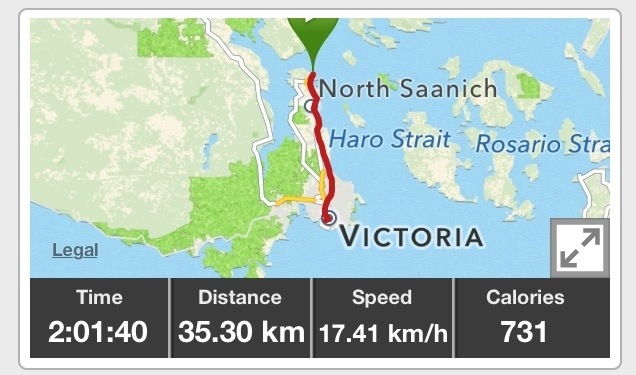 We did see the sun briefly this morning (and optimistically applied sunscreen), but then it showered and showered some more and for the last 20 kilometres it poured. We continued to follow the North Thompson river and CN railway (and the Kinder Morgan pipeline). We stopped at the Raft River and read about the history of the Simpcu People (part of the Shuswap Nation) and their relationship to salmon and the Raft River. 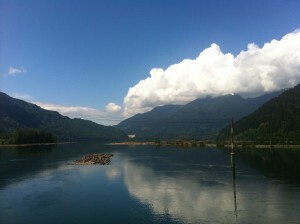 The Simpcu are still using traditional sustainable practices in harvesting salmon. From a tip from the cyclist we met Saturday, we stopped at the Log Inn Pub in Avola, which boasts “Worlds Famous Burgers”. We did the try the veggie burger and it was pretty good. 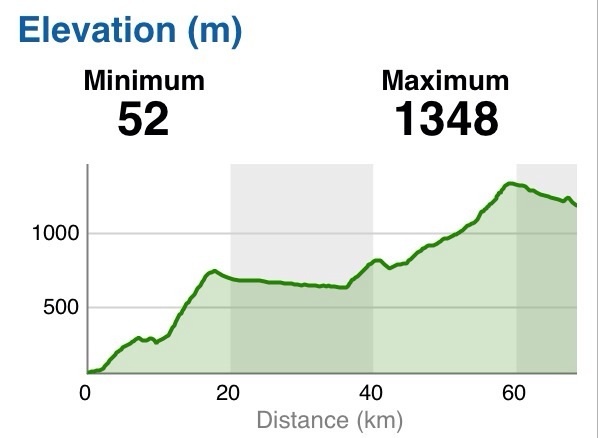 The road was fairly flat until 18kms past Avola, when there was a steep climb up to Messiter Summit (765 metres). From there to Blue River it was mostly downhill (which was just as well, as this is when it was pouring!) As we approached Blue River we got our first glimpses of the snow-covered Rockies. We checked in to the Blue River Motel – another gem found through Trip Advisor that we would never have known about from the highway. Wildlife sightings today: two bears and two moose. 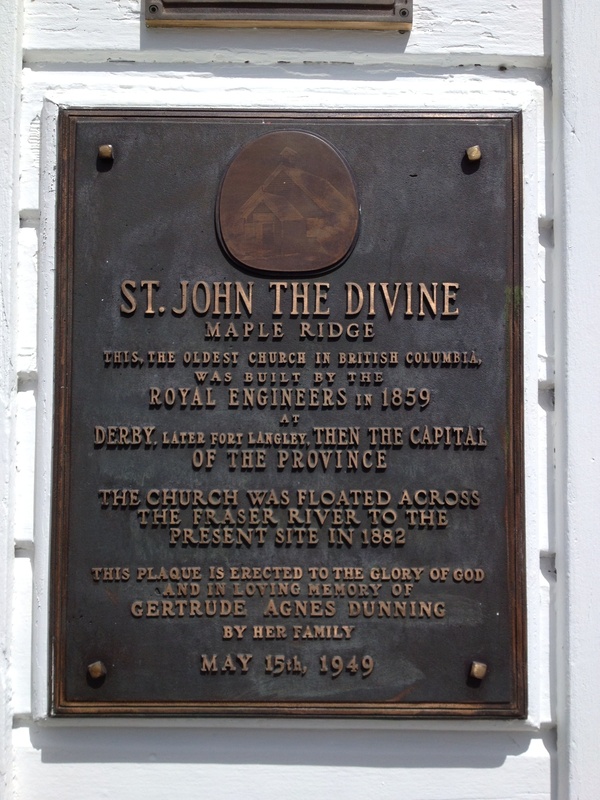 Sunday May 26, 2013. Day off. We’re staying in a “Victorian”-themed modern bungalow B&B. We were warned to look out for the bear that regularly wanders through the garden, but the only wildlife we have spotted so far is the owner’s Yorkshire Terrier, Milo. With laundry and bike maintenance completed, we spent much of the day in a German bakery, catching up on news and emails, and we also visited the informative visitor’s centre. 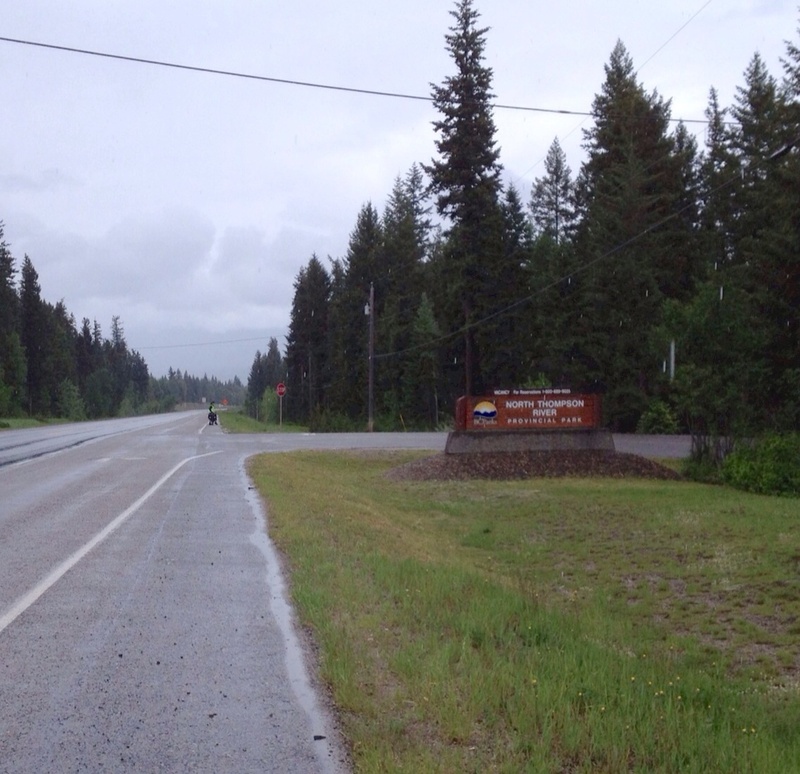 Clearwater is the gateway to Wells Gray Provincial Park. 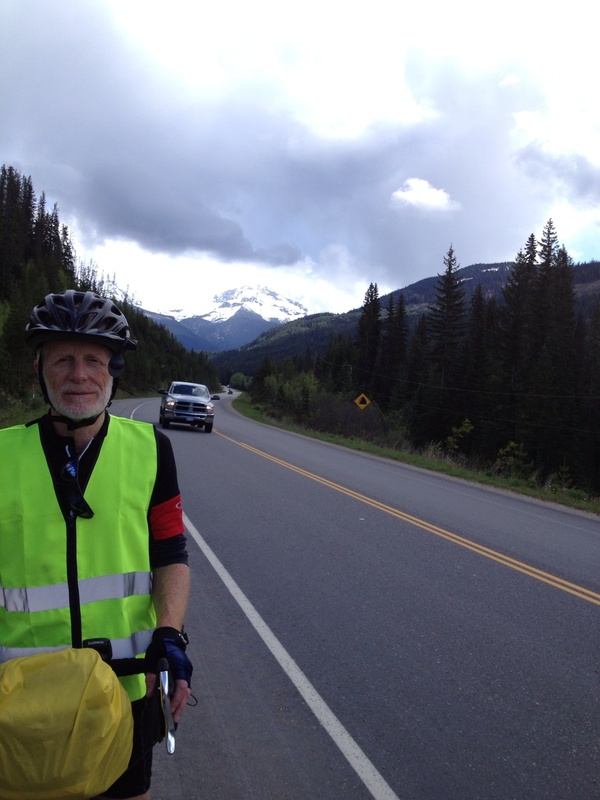 We would have liked to visit the park and view Helmcken Falls, but were not prepared to cycle the additional kilometers required. We will leave that for another time. We caught up with Maritia, Steve, Jade and Rhys on FaceTime and were able to watch J and R on their new swing set and see Jade riding her new bike. 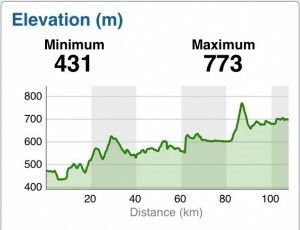 Maritia asked if we are having fun, which may not be all that evident in our daily preoccupations with weather, traffic, shoulders and elevation! We are indeed having fun. We love being outdoors, we love the Canadian countryside and we like being on our bikes. We expect that once our bodies become stronger and we get the “fit” of our bikes more finely tuned, we will enjoy it even more. Even the damp weather has had its benefits as the scent of wild roses has accompanied us all along the highway. Today we met our first fellow touring cyclist, who was riding from Calgary to Vancouver. We shared information on burgers(! ), hills and motels. 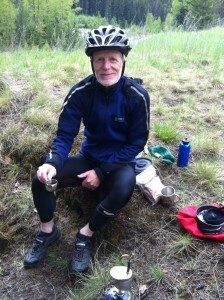 He was obviously “old school”, wearing a poncho, running shorts and his panniers were well worn. The rain, which was otherwise constant, let up briefly while we enjoyed the rest of last night’s pizza on the banks of a very full, North Thompson River. We had earlier stopped for respite from the rain at Little Fort, where we shared an enormous slice of Bumble Berry pie, (guilt-free cycling!). Observing birds is a day to day joy along the road. The highlights so far have been two active osprey nests and, today, a long- billed curlew perched on top of a tree. We’re still doing minor adjustments to alleviate pressure on hands and derrière, but are also noticing that some things are improving, like neck strain. 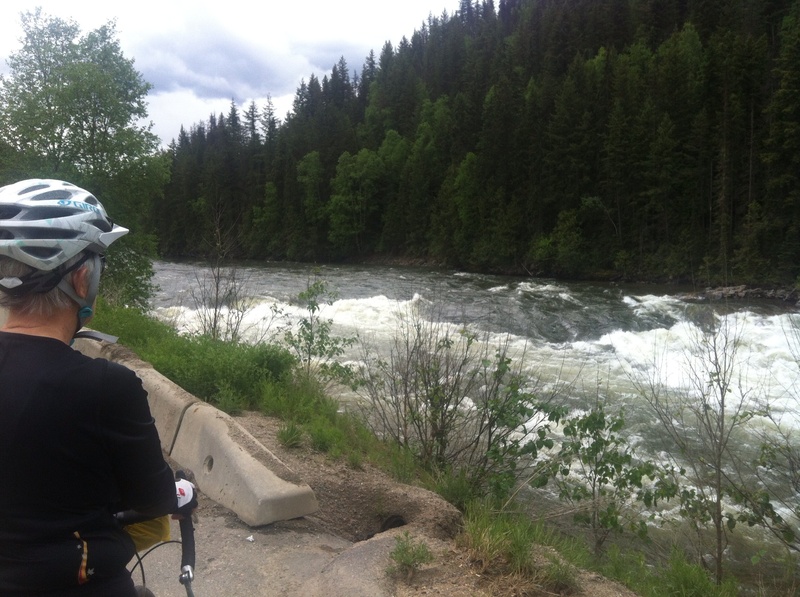 We are becoming more adept at avoiding falls – falls happen when we don’t unclip quickly enough (thankfully, no longer a problem for Lois) and because of the weight of our panniers, which can make the bikes unstable. Lois fell three times one day before we realized her panniers were unevenly weighted! The bruising is still resolving! 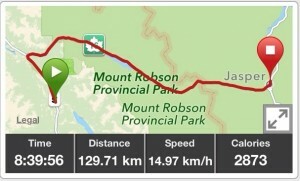 Day off tomorrow, before 3 long days to Jasper! We stayed again on the traditional territory of the Shuswap Nation. After coffee at Blenz (our new favourite! 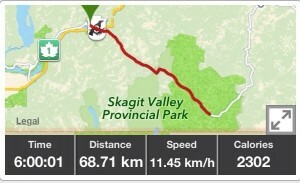 ), we went to the Spoke ‘n Motion. Paul decided to have fenders put on his bike, which this bike store was able to do right away; great service! 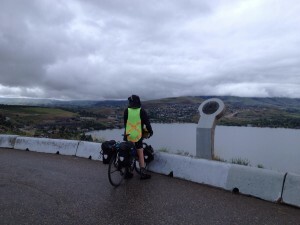 Through the rain and gravelly shoulders over the past week, there was a real difference between Lois’s bike, equipped with fenders from the start, and Paul’s, in the amount of dirt that had accumulated on the gears, panniers and water bottles. There was also the matter of the spray from Paul’s tires when Lois was cycling close behind! Sporting the new fenders, we crossed over the South Thompson river and followed the North Thompson, stopping for a picnic lunch at Heffley Creek. From Maclure to Barriere (see link re origin of name), we could see evidence of the 2003 forest fire, that burned 26,000 hectares of land and forest, including 70 homes. A volunteer fire fighter admitted to discarding a burning cigarette which started the conflagration. 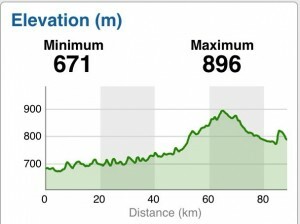 It was a fairly easy ride, although certain muscle groups and parts of our anatomy are still feeling the effects of a long ride yesterday. We spent the evening over pizza and beer at Sam’s (excellent stone oven pizza), keeping one eye on the Ottawa-Pittsburgh game and the other on the guy with spurs on his cowboy boots. 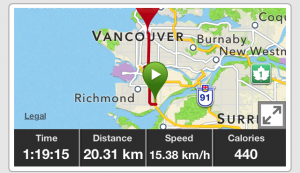 Note: the time on the map is cycling time and does not include stops. 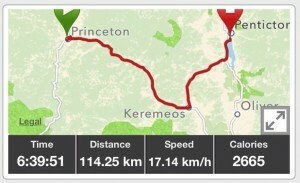 Today’s trip was about 10 hours. 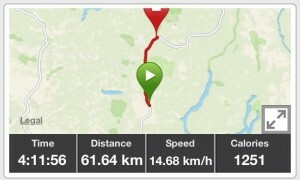 Also the total distance today was actually slightly longer according to the road signs! We changed plans and headed to Kamloops rather than Blind Bay on the advice of Percy-Anne and Jeri (thankyou! 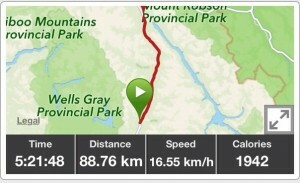 ), who said the Blind Bay-Barriere route we had planned was very hilly. After coffee at the Bean Scene and some debate (! 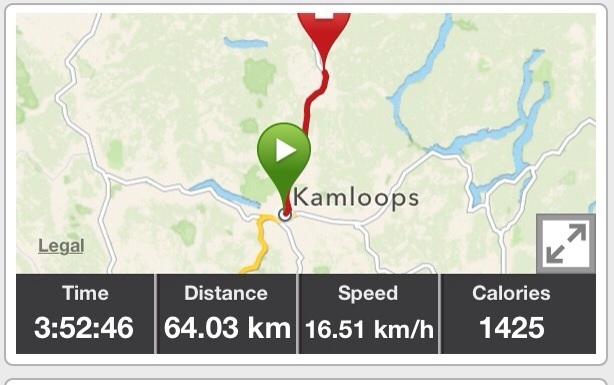 ), we took the quieter Old Kamloops Rd out of Vernon which joined the 97 after 11 kms. The 97 did redeem itself as the traffic was lighter and there was a good hard shoulder for the whole way. 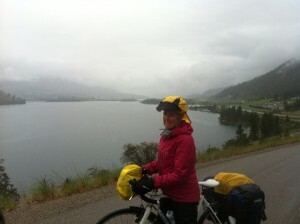 The rain held off and as we got closer to Kamloops, the skies cleared. We had lunch at the pub in Falkland, which is not only the home of one of the biggest rodeos in Canada but also to one of the largest Canadian flags. 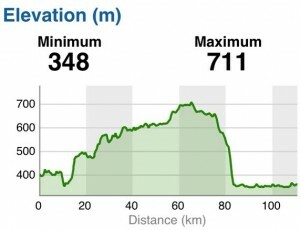 We realised we must be getting fitter when we were pleased to note we had only 40 km to go, after already putting in 75! 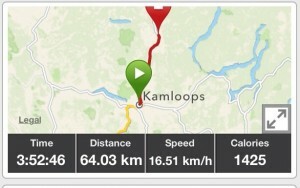 We cycled into Kamloops on the Trans-Canada west, probably the only time on this trip that we would cycle into the sunset! #1: it is possible to buy 268 acres of land in the upper Salmon River valley for the same price as a 1000sf condo in the Olympic Village in Vancouver. #2: has the cost of forest fires caused by casually tossed cigarette butts been included in the calculation of the burden of tobacco on society? 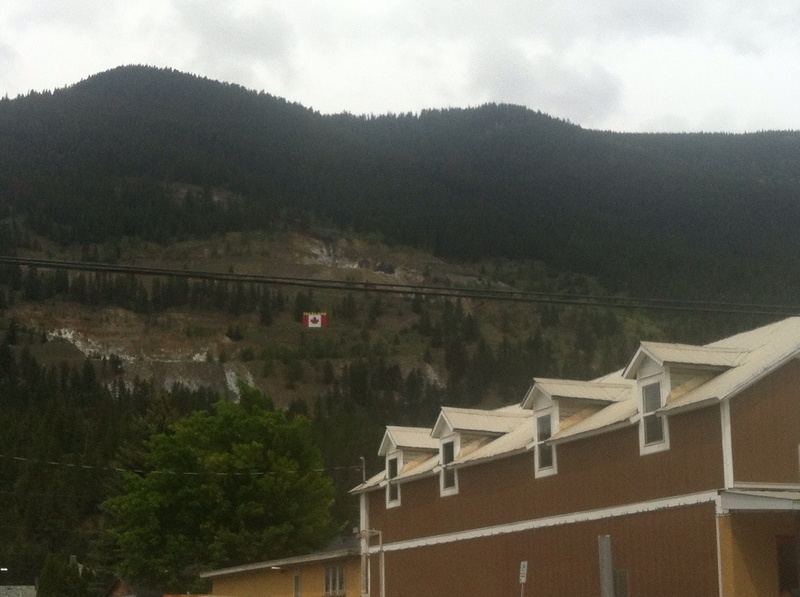 We are staying on the traditional territory of the Secwepemc Nation. We started out with all of our rain gear on today and kept it on for the entire ride, as the rain did not let up and it seemed to get colder in the afternoon. We followed a relatively cycle-friendly route to Winfield. After that it was the 97 which is now our least favourite thoroughfare. The traffic was heavy and the shoulders narrow. 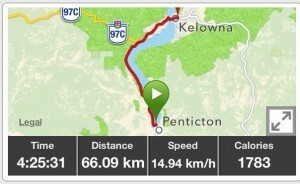 Close to Vernon, Lois suggested a side route which appeared to be an old highway running along the lake. This was much quieter, with very little traffic and better views of the lake. 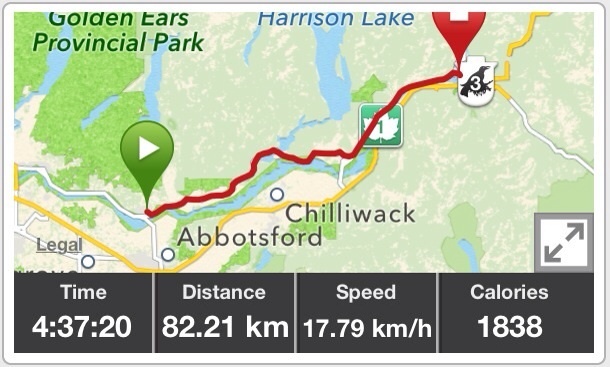 When that route eventually led back to the 97, we discovered a bike path beside the highway which took us the rest of the way into the city and we arrived in better humour. We had a delightful dinner and visit with the Cooke family. Paul was honoured to be chosen as the favoured story reader and Lois was invited to a game of “hockey” with 3 year-old Daniel. 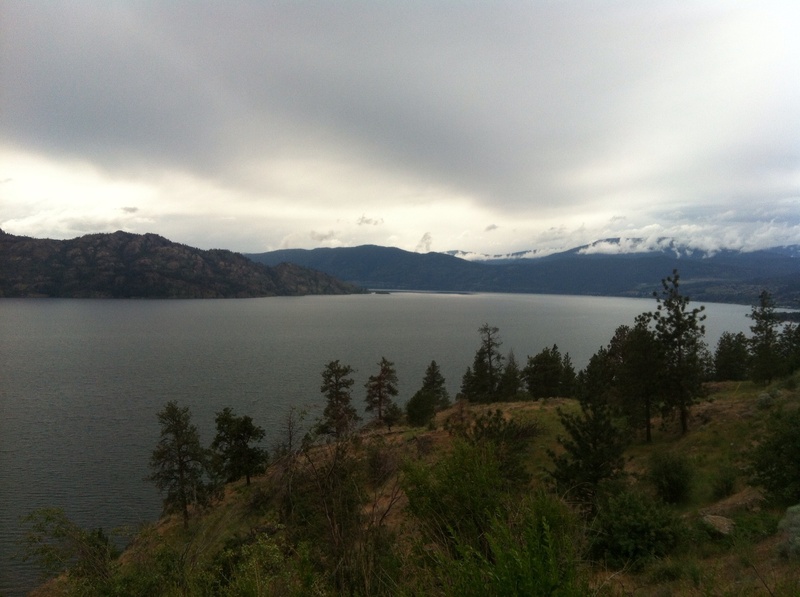 We are still journeying through the Okanagan First Nations territory. 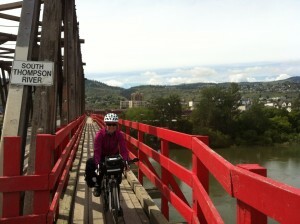 We stopped at the Bike Barn in Penticton, first thing, so that Lois could dispense with her clipless pedals. She found that they were not working for her on narrow, uneven shoulders with heavy traffic. Her bike is now sporting a new pair of standard pedals and she can use her same shoes with the cleats removed. The new pedals are working well. 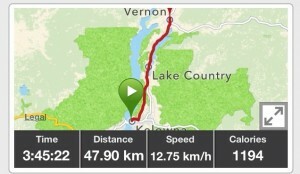 Until Peachland, it was a pleasant ride along the lake, despite some rain and distant thunder. After tea on the waterfront at Rocky J’s Beach Hut, and some respite from the rain, we began a slow long climb up to Westbank. 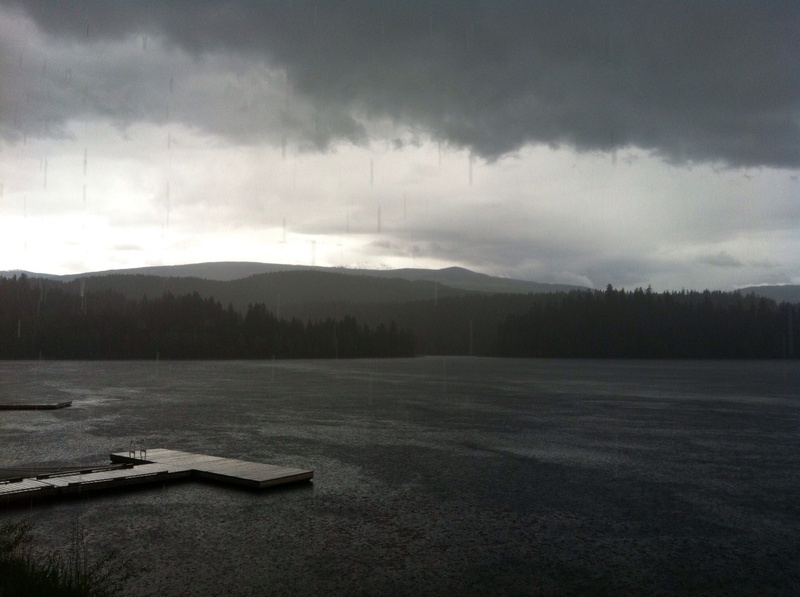 The constant traffic was intimidating with the narrow shoulders, and the rain continued. 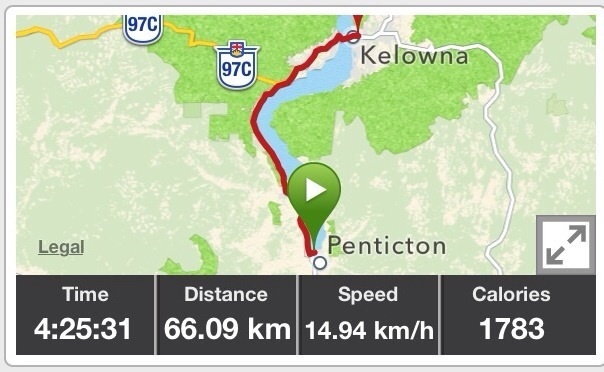 In West Kelowna we went off on side roads to get away from the highway traffic and were helped by a local cyclist, who also told us how to get onto cycle routes across the bridge in Kelowna. After checking in to our hotel, we were picked up by old friend Percy-Ann and her husband, and spent a wonderful evening together in a great local restaurant, The Yellow House. 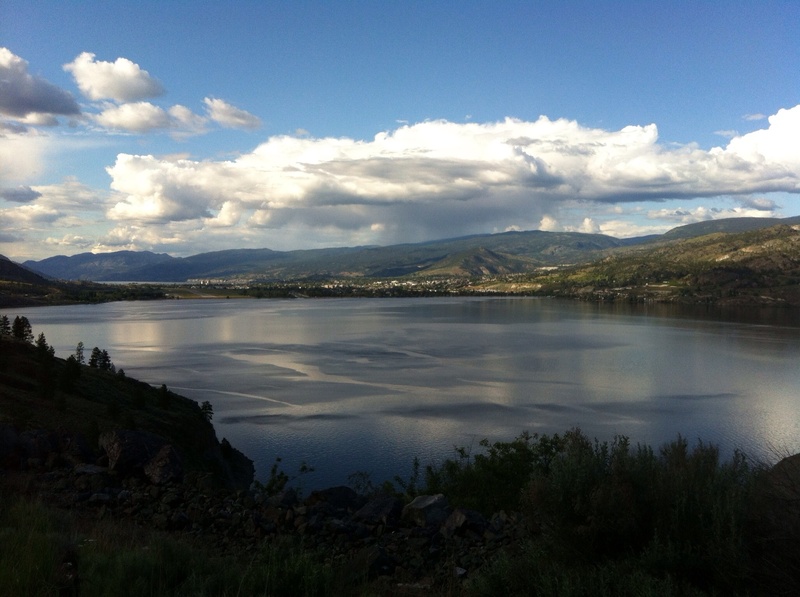 We passed through the territory of the Westbank First Nation and again stayed in the territory of the Okanagan First Nations. We were determined not to bike anywhere today, so after breakfast and laundry, we took a cab to the city centre for coffee and a walk along the waterfront. We wanted to do a wine-tasting tour, so headed over to the BC Wine Information Centre, where they very helpfully set us up with a tour with Grape Escapes Wine Tours We were picked up by the owner, Doug Dean (Dino), and given a private tour of five wineries along the Naramata Bench, ending with an excellent meal on the patio of Hillside Winery, overlooking Okanagan Lake. Each of the wineries had its own unique style and personality – from Ruby Blues (previously Ruby Tuesday – she had permission from the Rolling Stones to use the name, but it seems the Stones had not protected the title and the winery was sued for infringement by an American restaurant chain of the same name) where rock music was piped into the vineyard, to Hillside winery, which began with a few Muscat Ottonel vines smuggled out of Czechoslovakia. 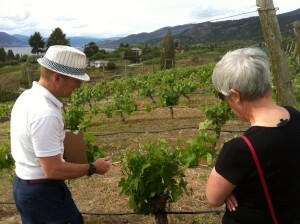 We were told that the BC wine industry really took off, with the help of the Agriculture Research Centre in Summerland, following NAFTA and the influx of good cheap Californian wines in 1988. The tour was informative and fun and the wines were superb. Back on our bikes tomorrow. We had breakfast at Coco’s Bistro. It opens at 4:30 am to serve the miners (we weren’t there that early!) 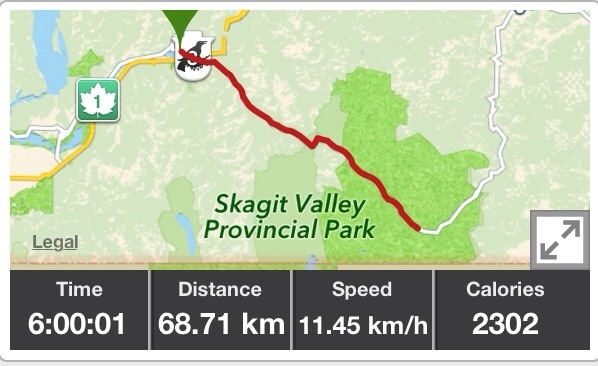 We had intended to follow the Kettle Valley Railway trail/Trans-Canada trail to Summerland, but were told, over coffee, that off-road motorcycles were chewing up the trail. After checking out the start of the route it was clear that our touring bikes would not work on the unpaved surface, at any rate. 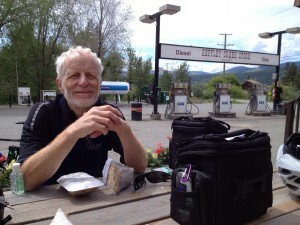 Carrying two large freshly baked cinnamon buns, we headed off on the Crowsnest highway instead, to Keremeos and Penticton. This proved to be a serendipitous choice as the first half was mostly downhill with a wide shoulder. 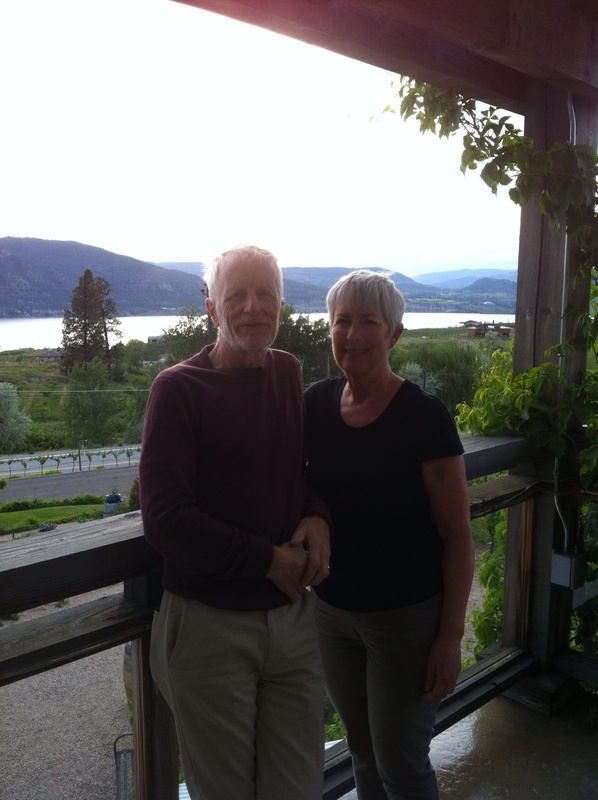 The weather was good and we followed the Similkameen Valley, through sage brush country, past the old gold mine at Hedley and then into orchard land. After an ice-cream stop at Keremeos, we climbed until we were overlooking the Okanagan Valley. Although not steep, the hills were tough after a long cycle and we were glad when we could see Penticton in the distance. Tomorrow is a day off! We travelled through the Upper and Lower Similkameen Band’s land and remained within the territory of the Okanagan First Nations. Today we cycled 67 kms but the Garmin “froze” so we have no map or stats. We woke to the tweets of a couple of Barn Swallows on our window sill, and a chilly morning. 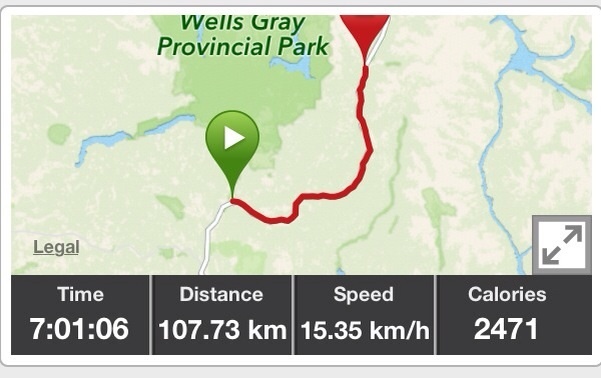 Looking forward to an easier day, we carried on on the Crowsnest Highway, following the Similkameen river, descending for several kilometres, before climbing again to Sunday Pass. The weather was sunny and showery, which meant we were continually stopping to put on/remove jackets and helmet covers, but did manage to have an espresso stop (camp stove) and picnic lunch between showers. The Similkameen valley is beautiful, though much mining activity (copper and gold) closer to Princeton. 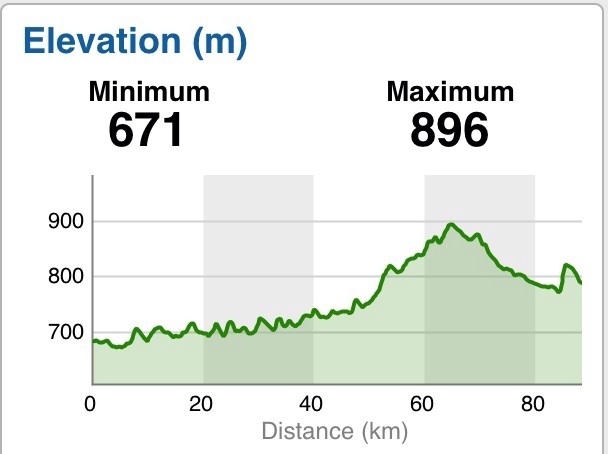 All in all, a good day, although still acquiring our “hill” legs. Today we stayed again, on the traditional territory of the Okanagan First Nations. It was a tough, long day. 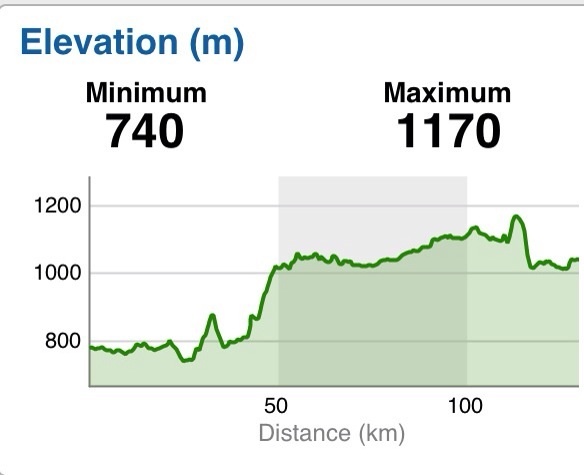 Up to the Hope Slide was brutal, 20 kms, with the last 6 at an incline of 7%. After a valley we then climbed up to Allison Pass. The hard shoulders were minimal, if there at all, and half way it started to rain. With that and a temperature of 3 degrees C at the top, it was not much fun. We got lots of praise and encouragement from all those whom we met which helped, and we did see a bear, munching close to roadside. 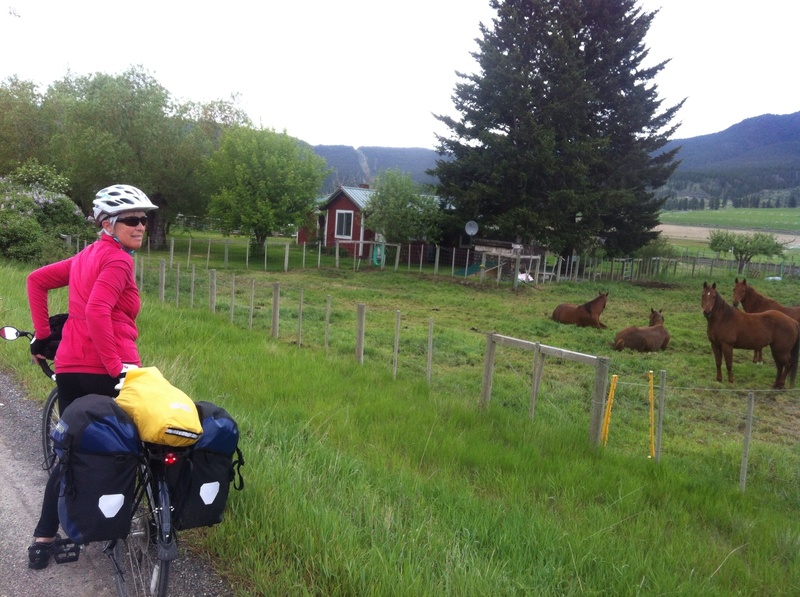 After taking a few photos, Paul pedalled away with the bear spray, leaving Lois standing between her bike and the animal! 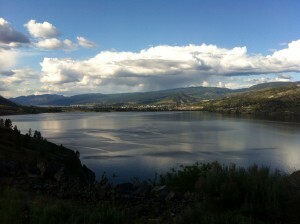 We stayed on the traditional territory of the Okanagan First Nations. Another good day, but tiring at the end. 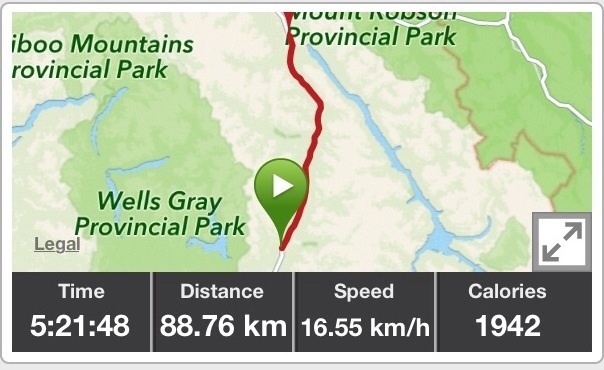 We did an extra 3 kms looking for our morning espresso, which, as it turned out, was worth it (Grab-A-Java). The traffic was lighter today and for the most part there was a good wide shoulder. We again followed the Fraser, climbing high above and and meeting it again before Hope. The river is very high and we were told when we stopped for a cold drink at the Sasquatch Hotel in Harrison Bay, that some campsites are still under water, just days before the long weekend. Checking in to the Swiss Chalets Motel, we were offered cleaning cloths for our bikes, which we have to keep in our room. We had an early dinner at Kibo Sushi where we met three wildlife biologists involved in some environmental assessment work for BC Hydro. They suggested that we carry bear spray and very kindly brought a spare can to our room. 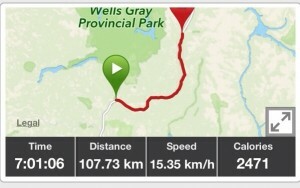 As if the ascent to Manning Park tomorrow is not enough to be concerned about! We stayed the night on the traditional territory of the Chawathil First Nation. 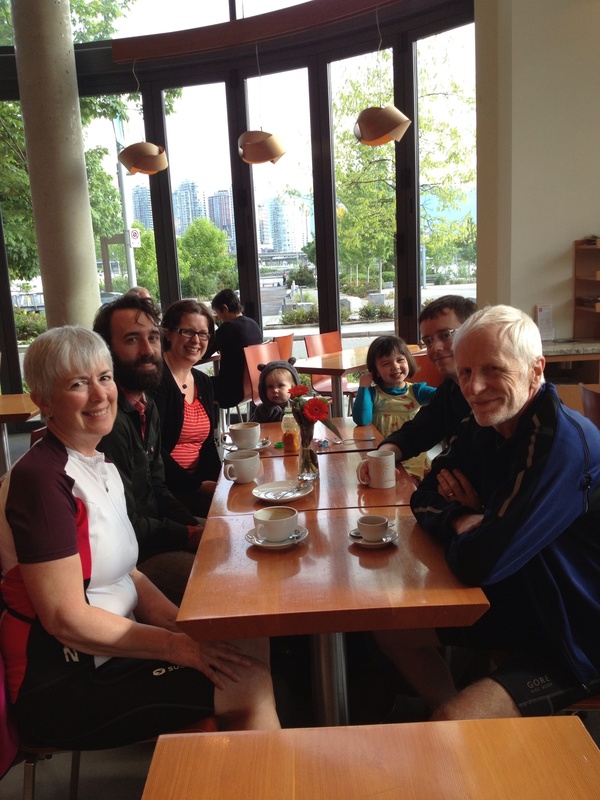 We said farewell to Chris, Maritia, Steve, Jade and Rhys after coffee together at Terra Breads. We followed bikeways which took us up to Burnaby Mountain, then on to the Barnet, then Lougheed Highway, which we will take all the way to Hope. We passed through Port Moody which was for a short time the terminus of the CPR but was eclipsed when a line was built into Vancouver. In Maple Ridge, we visited the oldest church in BC (1859). Then we followed the Fraser River and the aroma of newly milled lumber to Mission, arriving on the territory of the Stó:lõ First Nation. The Mission Spring IPA went down well! Tuesday May 7th, 2013. Day 1! 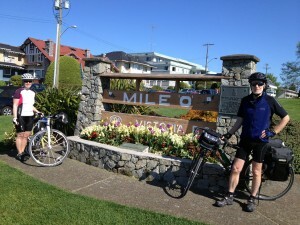 Day one of our cross-Canada tour took us from Mile 0 of the Trans Canada highway, Victoria, to home, a cycle of 67 kms. 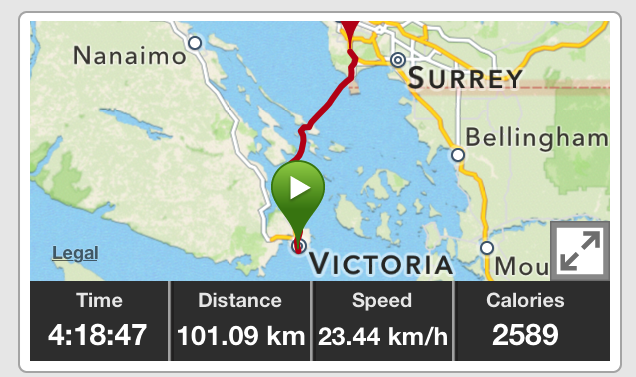 The map includes the ferry ride which was not really difficult, as we were enjoying the sun out on deck. 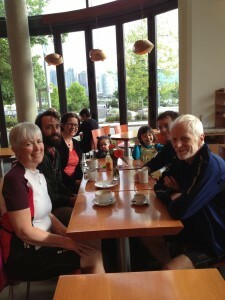 The day started with breakfast at our hotel with Dave, Kate, Heather, Isy and Rod. It was great to see old friends as we begin the trip. 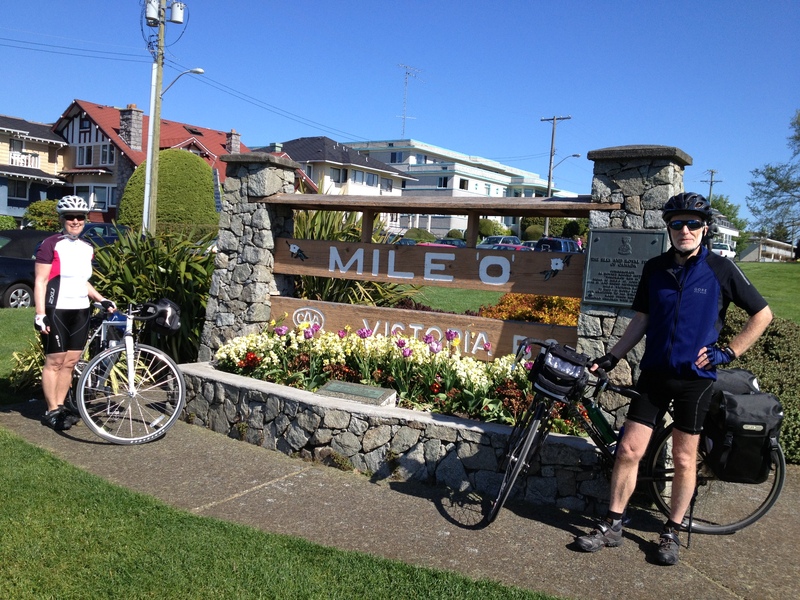 We cycled along Dallas Road to Mile 0 for the obligatory photos. 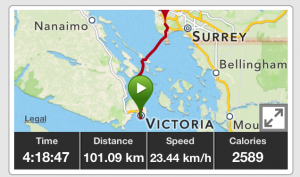 Lois wanted to dip the back wheels of her bike in the Pacific ocean, but there was no easy access to the water and we were anxious to make the 1:00 pm boat. 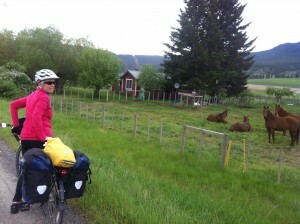 We followed the Lochside Trail again out of Victoria, stopping at Matticks Farm for coffee. Lois carried her iced latte in one of the bottle cages! 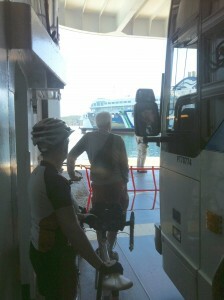 It was another beautiful day and we again enjoyed the ferry crossing sitting out on deck watching for whales. 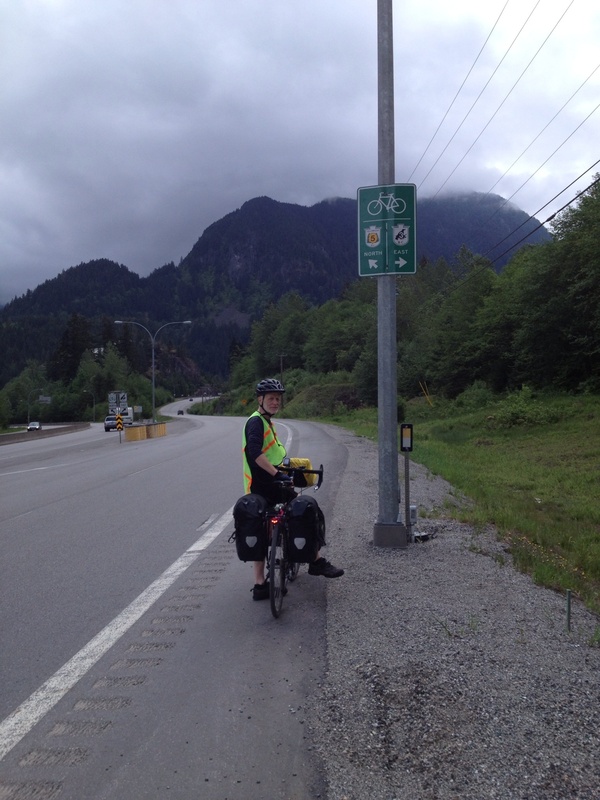 Cyclists cannot (and probably would not want to) go through the George Massey Tunnel. We got to Ladner (Bus) Exchange just in time to catch the #620. The driver dropped us at the first stop north of the tunnel at no charge. 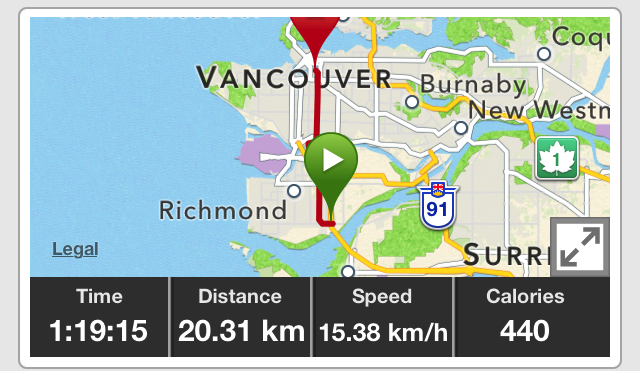 We could have ridden slightly further to take the shuttle but we would have had to wait. The cyclist who admired Lois’ bike while we were waiting to leave the ferry, and disappeared into the distance in Tsawwassen, overtook us again on the Canada Line Bridge. He must have taken the shuttle! 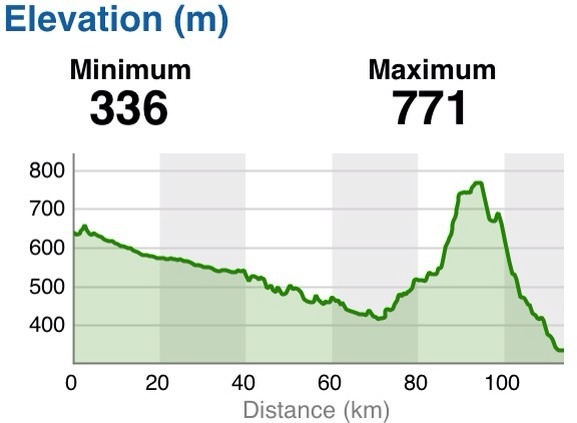 The run into town was uneventful, although we were unprepared for the heat and will need to remember to drink more water when we are out on the road. 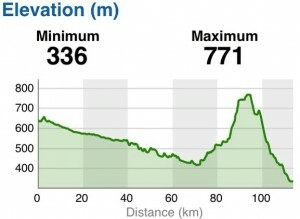 Today was the warm up for Mile 0 tomorrow. 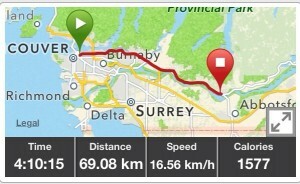 We took the Canada Line and then the bus to Tsawwassen. Paul was pleased to have looked at the You Tube video of how to mount a bike on the front of a Translink bus, but then we got on board to find out that we needed to pay for another zone. This required Paul to call out to the assembled passengers to ask for change. This was forthcoming as were conversations on what we were doing etc etc. The man opposite was enjoying his retirement and was off to visit a friend on Mayne Island, drink beer and play his guitar. 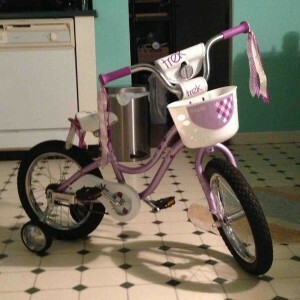 An older great grandmother was still having to work to ensure that her grandchildren have shoes….We are already getting a taste of the role our bikes can perform as conversation openers. After a sunny crossing spent out on deck, during which we spotted the dorsal fins of a couple of orcas near Active Pass, we readied our bikes for disembarking at Swartz Bay. You do get a good view when the ship docks. 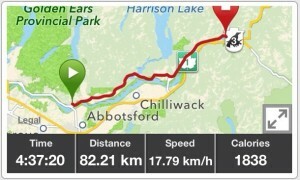 The cycle into Victoria took us along the scenic and blossom-scented Lochside Trail. Formerly a railway line, the trail passes through parts of Sydney and other towns along the way which we don’t see from the highway. We had a lovely barbecue with Isy and Rod at their house in Victoria, catching up and hearing about their Mexican winter retreat. 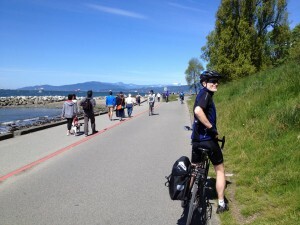 We were out on the seawall again today, along with hundreds of others, this time on our shiny new bikes. The open road beckons! While getting used to beng clipped in, we have each had a couple of tumbles. These from not getting out of the clips quickly enough, forgetting about being clipped in, and from a rogue dump truck that slowly ran a stop sign in front of Lois. We have bruises and scrapes to show for it! 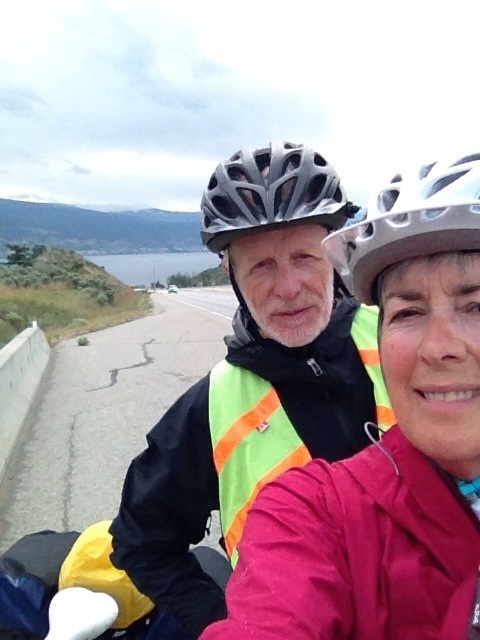 The position of Lois’ handlebars has been fine tuned and we will be back at West Point Cycles, after our trip to Victoria, for a final consultation.